Tell us about yourself: 23 year old graduate student in Arlington, VA. Newly minted dog dad of my first Dutchie, Raven. Hi all, Raven and I have been having a good time working on imprinting and some basic commands so far. She's a bit of a riot, but the challenge has been fun. I am having a lot of trouble however with house breaking and walking her. Sometimes she obeys me very well on the leash and will walk with me like it's nothing. Other times we will sit outside forever and she'll plop down in the grass or start digging and not even budge when I try to walk with her - sometimes even ignoring being coaxed by treats. This adds to the problem when we'll sit outside for 30 minutes and she'll do nothing but chase bugs, but then as soon as we come inside she will go to the bathroom on the floor. This seems to be her habit now and I want to break it ASAP before she gets too accustomed to it. Usually when she goes in the house I give her a stern "Stop!" and take her outside, but I can't reinforce any positive behavior of her going outside if she never does it. Puppy is always in her ex pen when not on a leash, or we have a constant visual on her. The ex pen is in our kitchen because accidents happen. She is pretty much housebroken but she is a puppy. We don't say anything when an accident happens. We scoop her up and take her outside to the place we set aside for "breaks". Also she is on her leash here so she cant wander off to play. We clean up her house accidents immediately and neutralize the scent. What we do to try to prevent accidents is frequent breaks. We call it taking a "break". She is taken outside on her leash to her spot when she wakes up, has been playing for 30 minutes or so or after she eats. When we get to her spot, I only say take a break once or twice and we stay in that area pretty much stationary until she pees or poos. She tugs on her leash but I don't budge. I always praise her afterwards. Other than telling her to take a break I don't talk to her until she's finished. Thanks! I think the key error I'm making is verbally acknowledging it at all by telling her to Stop, and that I go to clean it immediately before taking her out. I think she's considering this somewhat of a game, she really goes after the cleaning spray bottle and the rag I use - I think this explains why she goes so frequently and in such small volumes. She may consider it a "game," she goes inside a little bit, gets my attention, and then I bring out the rag and spray for her to "play" with. If so, smart girl! Gotta reinforce her the other way. Ohhhh my girl will purposefully continue to eat dirt as I try to tell her to stop. So I bet it is the game. Rogue will run away from the dirt then run back faster than I can catch her leash to stop her. Stinkers. Tell us about yourself: Dallas, TX. 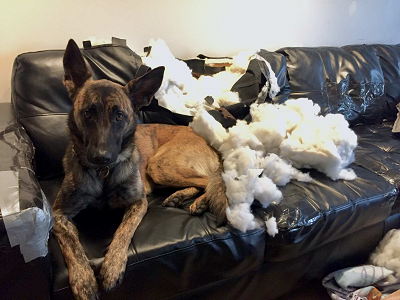 I have owned two dutch shepherds. Both were/are service dogs. I hope to trial in competitive obedience/tracking with my current puppy. I used "no" instead of stop (which is a command I use when I actually want her to stop in her tracks). And take her out IMMEDIATELY (have someone else clean the stain or wait until you get back). However, if she has an accident that you dont see while its happening- dont acknowledge it, just take her out and clean up immediately. Unless you tell them no while they are in the act, they will simply learn to hide it from you- which will be even worse to clean up. Lastly, time and patience. It took a couple months before my dog was potty trained, but its such a wonderful feeling the first time they ask themselves to be let out so they can use the bathroom.